The British edition of GQ magazine is facing a potential fine for contempt of court, in relation to an article it published last April. 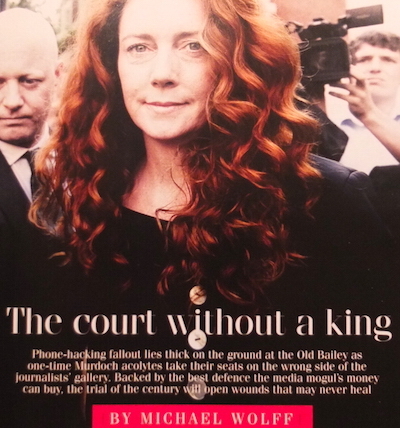 The article, The Court Without A King by Michael Wolff, was an analysis of the trial of Rebekah Brooks and Andy Coulson, who were both charged with phone-hacking. Wolff, author of an excellent Rupert Murdoch biography, implicated Murdoch in phone-hacking and claimed that News International was funding the defendants' legal costs: "The more guilt that might be ascribed to him, the less for the defendants. That might logically have been a defence ploy: to make the defendants victims of the far-off monster... Also, not incidentally, Murdoch is paying for much of this grand defence, by some estimates the most costly in British legal history." During the trial, the judge referred the article to the attorney general, who has now recommended that the magazine should be prosecuted for contempt of court. GQ has contested the charge, though it has deleted the article (and all references to it) from its digital archive.